The outgoing UN envoy for Syria, Staffan de Mistura, will arrive in Damascus on Wednesday for a visit aimed at convincing the government to accept the creation of a committee to draft a post-war constitution, the world body said. De Mistura, who announced last week that he would step down from his post at the end of November, is expected to stay for a “couple of days” in the Syrian capital, deputy UN spokesman Farhan Haq said Tuesday. Haq did not say who the envoy would meet, and if that list would include Syrian President Bashar al-Assad. 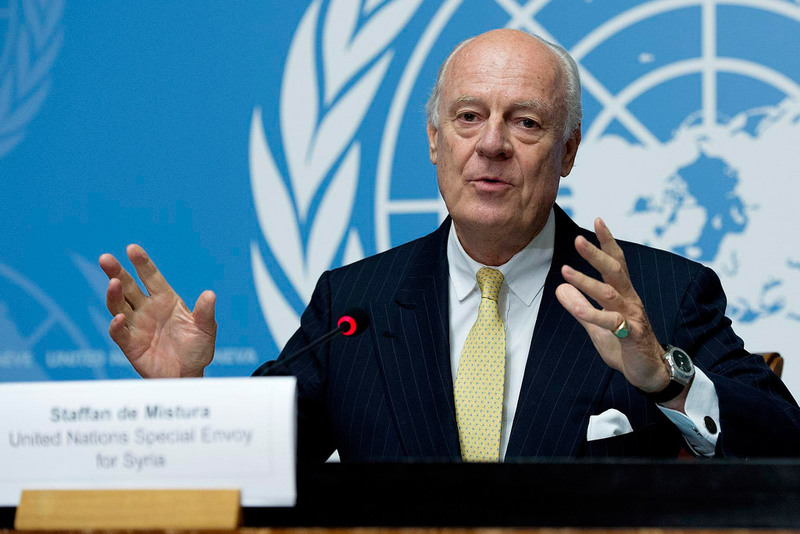 Syrian authorities invited De Mistura to visit, the spokesman said. Under intense pressure from Western countries, who accuse Damascus of stonewalling, the UN envoy will try to ease the concerns of the Syrian government as to the make-up of the constitutional committee — which has been in the cards for months. The West wants De Mistura to get Damascus to agree to convene the committee as soon as possible to revive the political process aimed at ending Syria’s devastating war, now in its eighth year. The new constitution is seen as a stepping stone to staging elections in Syria, where more than 360,000 people have been killed since war erupted in 2011 with the brutal repression of anti-government protests. The uprising has since morphed into a complex conflict with myriad armed groups, some of whom are foreign-backed. The UN-backed political process has suffered in the face of parallel efforts led by Russia, Turkey and Iran, and as the Syrian military has progressively regained control of most of the country. The constitutional committee is expected to include 150 members: 50 chosen by Damascus, 50 chosen by the opposition and 50 chosen by De Mistura. The Syria government is objecting to the UN-led effort to include civil society representatives, religious and tribal leaders, experts and women on the panel, De Mistura has said. Fifteen people would be chosen from the three factions on the committee to draft the new constitution, according to the UN plan. The 71-year-old De Mistura, who is the UN’s third Syria envoy in six years, says he is leaving the post for “purely personal reasons,” wanting to spend more time with family after four difficult years of work. The Italian-Swedish diplomat’s predecessors include former UN secretary general Kofi Annan and veteran Algerian diplomat Lakhdar Brahimi.